Lucid Road Trippin' - Lucidity Festival 2016 – The VanLife Co. This month has been filled to the brim with new experiences, new friendships, and new roads for Betsy Vanessa and us. 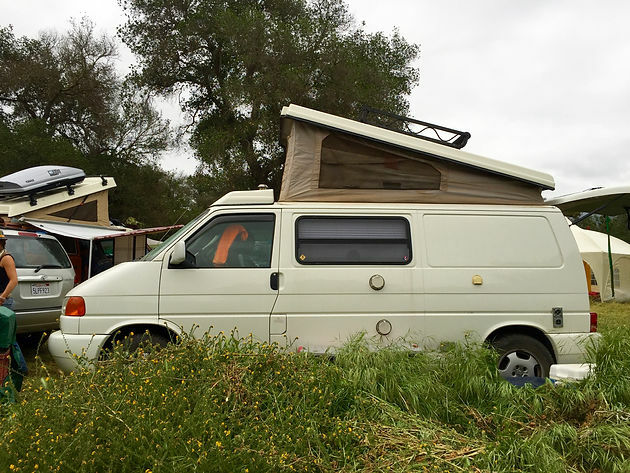 We packed up the van Tuesday (4/5/16) in preparation to meander down the coast slowly, from Santa Cruz to Santa Barbra with plenty of stops in between. We decided a calm night somewhere in Big Sur would be first on the list. Since we've had countless van friends tell us to camp on Nacimento-Ferguson road south of Big Sur, we thought we'd finally give it a try. We pulled up to a big turn out overlooking the vast pacific ocean below and the lush Santa Lucia mountain range above. It seemed like the perfect spot - even equipped with a handmade fire ring from previous campers! I searched for wildflowers while Hawk practiced his knife-throwing skills. As the sun set, a strange wind blew in that was not only forceful but HOT! We were forced to hunker down in the van and call it a night. The howling winds became so intense that we'd be woken up at 3:00 am, jumping out of bed half naked to close the pop-top as quickly as possible. We finally got a few restful hours of sleep as the van swayed in the unusual coastal winds. When we woke in the morning the wind hadn't let up and we realized a thin layer of fine dust covered every inch of the van - inside and out. "Lets get out of here," I proclaimed to Hawk! Our next destination was Los Osos to visit our buddies at GoWesty. As we cruised down Highway 1, we stopped to see zebras, elephant seals, and talk to a Cambria local about surprising a friend Hawk had worked with years ago. I was giddy with excitement as I had never seen this part of California before, and the Universe seemed to be guiding us to the most magical places. We arrived at GoWesty in the early afternoon for a quick tour from Jad, and to meet the wonderful crew behind the company! Jad gave us a great tip to head towards Montana De Oro State Park to cook some carne asada street tacos and enjoy the sunset. I couldn't believe in our modern times that there is still one last free state park. 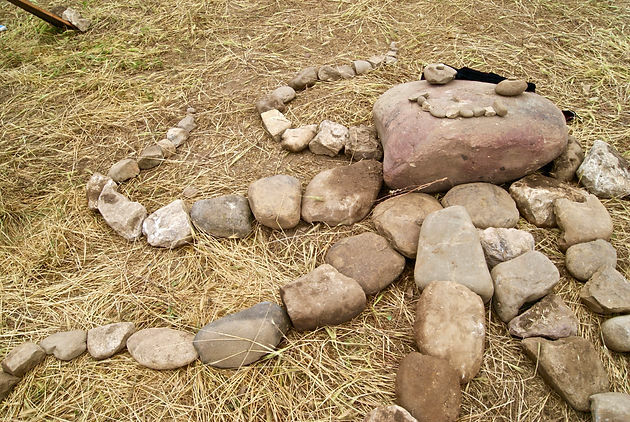 I made rock mandalas with the wide variety of tumbled ocean stones, and Hawk scaled the beach for shells and sea-glass. After we wrapped up dinner, we headed to the local ale house to share a beer and stories with Jad, Mike, John, and Andrea from GoWesty. 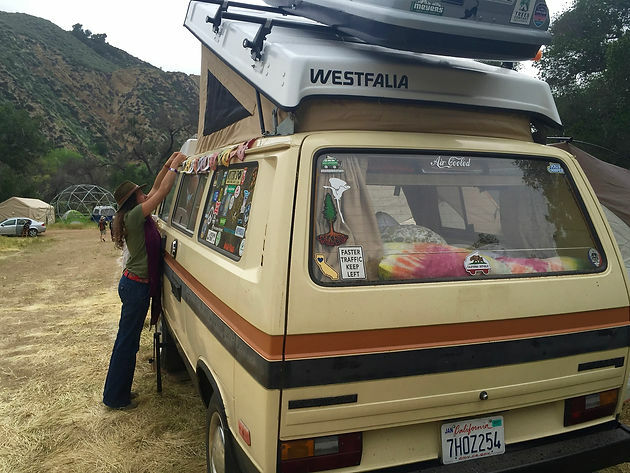 We instantly felt welcome into their little van-family and laughed the night away, chatting about all things Vanagon. Jad hooked us up with a wonderful friends driveway to park it for the night right along the edge of the bay. 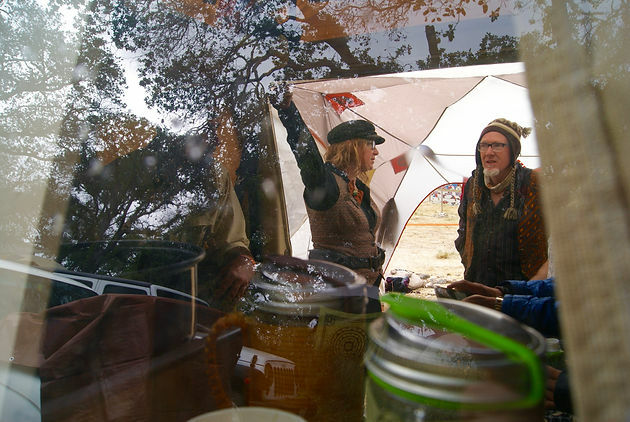 We climbed into the van and called it a night, eager to head to Lucidity in the morning. When we awoke Thursday morning, we couldn’t wait to arrive at Live Oak Campground and get settled in for the weekend. We loaded up the pantry and our solar fridge, stopped for a quick soak at Avila Hot Springs, and drove the short hour and a half down the coast to the campground. Upon arrival we were blessed by beautiful handpainted signs, brightly-colored volunteers working the front gates, and a light drizzle from the grey sky above. After a short wait in the queue we were off to roam the land and find the perfect spot to call home for the weekend. As we drove down Lucid Lane, we smiled and waved to all the bright faces. We were in complete awe of the crew putting the final touches on art installations, and sound checking stages. Since we live a nomadic life, we thought the 'Nomads Nook' would be a perfect village for us to settle in for the weekend. We parked on a perfect corner lot and quickly met Nick, the village mayor, who was camped amongst the oak trees behind us. We weren’t sure how many campers would fill in around us, as we knew most people would be arriving on Friday evening. Once we got the van all dialed in we embarked on a journey to find the Media Hub and check in for our weekend credentials. We were welcomed with a big warm hug from the master of all things media, Wesley Wolfbear! He gave us a quick tour of the hub and introduced us to some of the media family, including his own mom and aunt! With evening approaching we headed back to the van to cook some dinner, share laughs and stories with our neighbors, and connect with friends we hadn’t seen in months. I called it an early night as I knew the weekend would be filled with loud music, and lots of excitement. As I shut my eyes to rest for the night I thought to myself, "We have arrived at adult summer camp!" We rose refreshed on Friday to discover only one new neighbor had camped by us - but we would see how things filled in throughout the day. Our buddies Jackal, and KristaLove stopped by the van during their round of dropping off coconut waters to the crew, and expressed interest in setting up a 'Free X-Change' on our front lawn. Since moving into the van, we've discovered a LOVE for trading and bartering as it feels more meaningful for both parties involved. We said "YES," we'd be tickled pink to set the free x-change up in our little camp. I whipped out my art box and started drafting up a sign to hang, Hawk found a downed oak branch to hang clothing from, and our neighbors offered a colorful beach umbrella to keep all the items dry during any rain storms. Jackal dropped off a box filled with costumes, snacks, and other survival essentials and we quickly got to work hanging and displaying the items. After setting up the tree we roamed around the campground and tried to capture the magic we encountered while still remembering to be in the moment and enjoy the now. We headed back to camp to meet up with our buddy Rob who had just arrived and was hiking his gear in from the upper lot. Rob also lives full-time on the road as a climber and photographer, and was lucky enough to be someones guest at the festival. At first he didn't know if he was going to be able to make it, but we proclaimed he had to come and enjoy the festivities. When he arrived he told us this was his first festival ever, and we were stoked that he made the effort to come out! By this time evening was quickly approaching and we met up with our buddies to boogie down, explore the beautiful scenery, play high line frisbee, listen to the wonderful beats, and finally drink the most amazing blood orange, grapefruit, tangelo juice in the whole wide world. (That is not overexagerating). The amplified music at Lucidity ends around midnight each night, and our bellies were gurgling from all the dancing we had just done. Jackal and Krista asked if we had ever tried the fried rice booth that we've seen at other festivals in the past, and we said "No, but it sure smells like heaven!" Krista got in line and ordered two 'Buddha Bowls' (half fried rice, half tom kha soup) HOLY SMOKES!!! They weren't kidding about the crazy-delicious phenomenon that was Get Fried Rice. We walked back to camp with happy bellies and called it a night, eager for our workshop in the morning and more play time with our friends. Awaking Sunday was a little bittersweet as we knew this was our last full day at Lucidity, and we knew a large chunk of people would be leaving that afternoon to return to life and work. The day turned into a beautifully intimate time to say goodbye to new friends that we met, and get to know people on a deeper level in the Nomads Nook. A great guy named Paul who we had met Friday towing in a tiny home and gyroscope, came by to relax and enjoy the Sunday evening vibes. 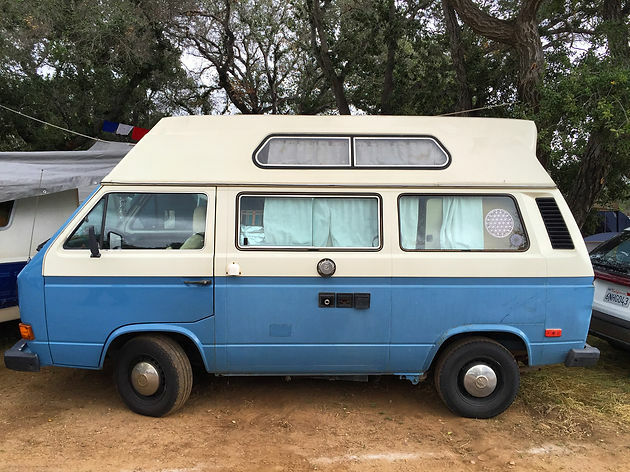 We chatted about his old VW bus, how he acquired a gyroscope, and sampled 7 different honeys left for us by a still-unknown person from Down To Earth Gardening Solutions. What a treat! We were pretty sleepy as the evening rolled in and knew it would be an early night for us - but not before a quick round of LED bocce ball, and a little more dancing with our neighbors. We roamed the Nomads Nook one last time and explored the temple filled with living veggies before we hit the hay. 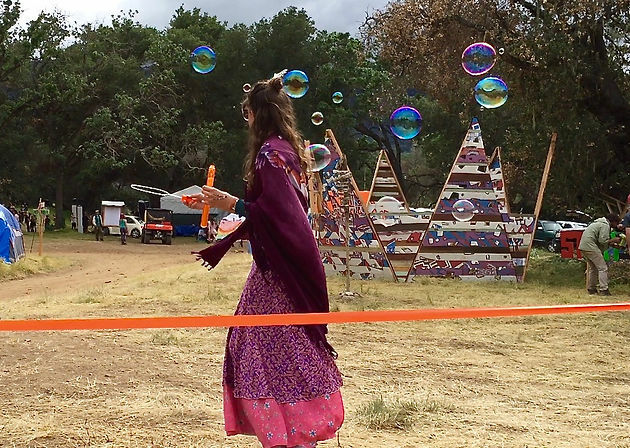 Our Lucidity story was coming to a close and our hearts couldn't be more full with love, laughs, sparkles, and an overall connection of feeling one with this amazing community of diverse people. We shut our eyes not knowing what tomorrow would bring, but were riding the natural high of life. We woke earlier than most Mondays and decided to pack up camp, and try to get out of the campground before the 3000+ person exodus that would happen throughout the day. 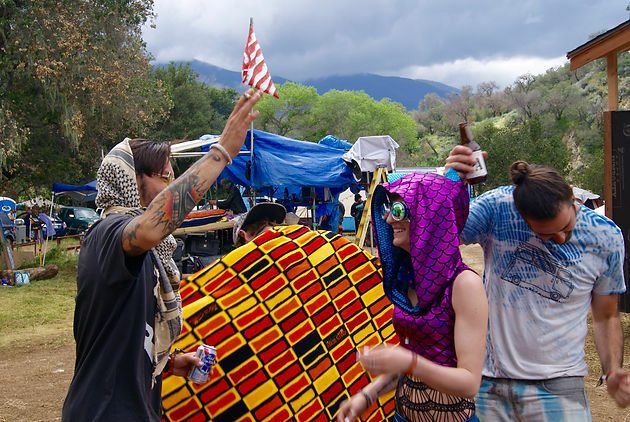 We hugged friends goodbye as they popped out of their tents hearing the sound of the van starting up and left our campsite knowing we would always remember the times and friends we made at Lucidity 2016. Of course there are always people you don't get to say goodbye to - so if we got the pleasure to meet your beautiful soul, please know that we are sending our love and joy always! 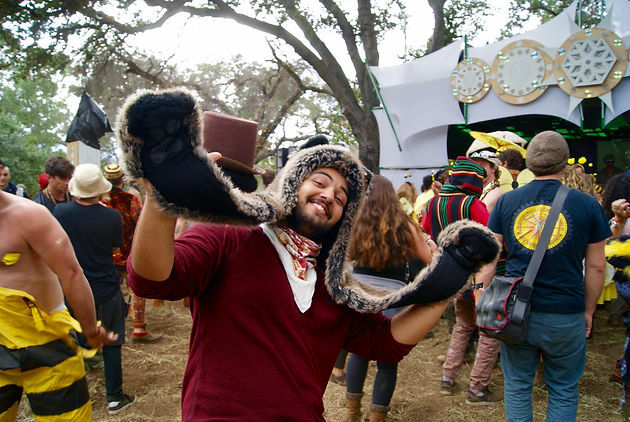 Thank you to the crew who worked long hours, the volunteers who shared joy throughout their many shifts, the musicians for providing funking incredible beats, and all the magical souls who made Lucidity so colorful and special. 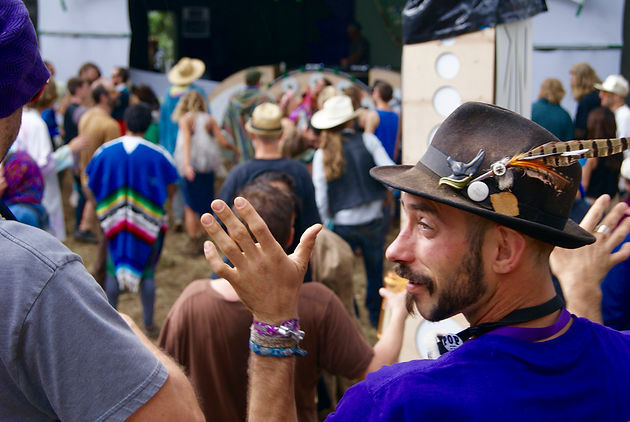 We can't wait to see what 'Chapter 6' of the Lucidity story has in store next year, as we are still feeling the strong vibes from this years gathering. Want more? Stay tuned within the next week or two for video highlights from the festival!